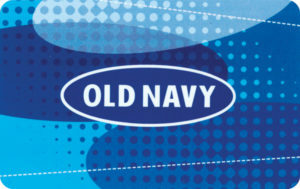 If you love stylish, quality clothes at unbelievable prices, then buy a discounted Old Navy gift card today! Finally, you can shop great clothes for the entire family, while saving money! Founded in 1994 and named after a bar in Paris, Old Navy has grown to 1,000+ stores worldwide. Designed with wide aisles and shopping carts, this store’s casual atmosphere makes shopping fun. You will find shorts, sweaters, pants and more for less money out of your wallet! Need new Jeans? No problem! They have jeans to fit every body shape, big and small. And with departments in Women, Women’s+, men, girls, boys, toddler, baby, and maternity, you will find something for everyone on your list. Saving money has never been so easy! One of the largest recognized brands in the world, an Old Navy gift card bought at a discounted price will save you lots of money. Just think, you can update your entire wardrobe without breaking the bank! Shop everything from jeans, t-shirts, and sweatpants to fashion accessories, for less! And that’s not all, because gift cards are considered currency, you can use your card in any of their 1,000+ nationwide locations and save money on your entire bill. Finally, looking great is affordable. Get your card today and enjoy shopping like you have never before known! Fashion is a must. And when you purchase an Old Navy gift card at a discounted price, you will save money on your entire bill. That’s right! Shop the stylish clothing you love while spending less money. Purchase a discounted Old Navy gift card today and shop the brand you love without breaking your budget! What’s more, Cards2Cash proudly offers discounted cards for many other department stores you know and love! Check out our Listings for Hollister, American Eagle, Banana Republic, Gap, and more! With Cards2Cash, looking great is not just easy, it’s affordable! Sell Cards2Cash your gift card! Do you have an Old Navy gift card you aren’t going to use? Cards2Cash will turn your unwanted gift cards into cash in your pocket. We pay top dollar for gift cards for everything from restaurants, Clothiers, and hardware stores to pet shops- you name it, we’ve got it! Visit one of our retail locations for immediate payment for your unwanted gift cards OR fill out our online form and we’ll make you an offer you can’t refuse. Whether you buy your gift cards from Cards2Cash or sell them- we’ve got you covered!